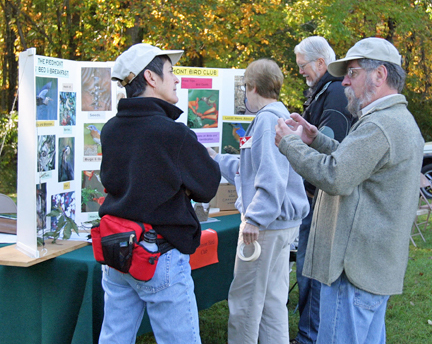 The Piedmont Bird Club conducts a variety of community outreach activities throughout the year. The Club’s community activities are in keeping with its focus on birds, but also reflect its commitment to environmental and conservation issues. Ongoing activities are listed below and are likely to be scheduled for the coming year. Please check the calendar as the specific dates become available in late summer. The Bur-Mil Park Fall Festival held in October offers games, activities and local vendors; everyone can find something to entertain them! You are invited to help with the Club's educational exhibit at this well-attended event. Sign up for a two-hour shift and on-the-job training will be provided. takes place from mid-December to early January. The longest running Citizen Science survey in the world, it provides critical data on bird population trends. The Spring Bird Count is sponsored by the Piedmont Bird Club and occurs in late April-early May. For these two events teams count birds in assigned areas within the designated 15-mile circle. Some teams may need new counters for all or part of the day, and new birders are welcome. Counters will be mostly riding or mostly walking depending on team assignment. Bring a drink and binoculars; dress for weather. The Great Backyard Bird Count is an annual four-day event in February for bird watchers of all ages. Count for 15 minutes on one day or as long as you like every day to help create a real-time snapshot of where the birds are. The Piedmont Bird Club adopted Country Park in 2004. The Conservation Committee and other volunteers from the Club join together twice a year to help improve the local environment by picking up trash at the Greensboro park for PBC’s Adopt-a-Park project. During the breeding season we monitor and service the nest boxes. Look for Adopt-a-Park signs at the entrances. Do a good deed, share some time with your colleagues, and spot a few good birds along the way. Buckets and grabbers are provided. The goal of Birdhouse monitoring is to help have the highest fledging success possible, especially with bluebirds. Monitoring is an on-going, flexible project that extends from early March to early August. Contact the Conservation Committee for more information.